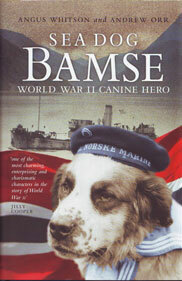 The exploits of Bamse have now been described in detail in the excellent book by Angus Whitson and Andrew Orr "Sea Dog Bamse; World War II Canine Hero". Published by Birlinn in August 2008 the hardback version was available in the UK, Scandinavia, USA, Canada, Australia and New Zealand but has now sold out. Released as a paperback in October 2009 it is selling just as stongly. The stories of Bamse are set against the invasion of Norway and the escape of many to the UK and their subsequent war efforts. "Bamse is one of the most charming, enterprising and charismatic characters in the story of the war"
71° 10’ 21” NORTH - Bamse Authors’ Most Northerly Book Signing! Bamse authors Angus Whitson and Andrew Orr have laid claim to performing perhaps the world’s most northerly book signing when they attended a special event at Honningsvåg, near the North Cape of Norway, on Saturday 20th June 2009. There can be few bookshops in the world that are situated nearer to the North Pole! Their best selling book Sea Dog Bamse tells the story of the famous Norwegian St Bernard dog that came from Honningsvåg to Scotland in World War Two. The renewed interest in the story of Bamse following the erection in 2006 of an iconic statue at Montrose and the success of the Birlinn book has been keenly followed in Norway. The Kommune of Honningsvåg decided that it, too, would like a statue of the legendary canine, which would be seen and enjoyed by many of the nearly 250,000 visitors to the North Cape each year. And so the statue was duly unveiled to the skirl of bagpipes on 19th June 2009 in a large and memorable ceremony, the main event of the Honningsvåg Midsummer Sun Festival. Amongst the 36 visitors from Scotland were Angus and Andrew, the co-authors of the book that had helped to bring things to pass. The main bookseller in the town G.Hagen laid on a book signing the following day – but there was a slight problem – most of their stock had already been snapped up! Fortunately they had held some stock back for the event, and Andrew Orr was able to supplement this from his suitcase! The available 32 books were signed and sold in as many minutes, leaving many disappointed Bamse fans, but the authors were able to chat about the story (and about Bamse’s own tartan) with those attending over the next hour or so. Picture legend: Angus Whitson (L) and Andrew Orr at G.Hagen Bookstore, with books laid out on Bamse tartan.